NEW ALUMINIUM FRAME 25" x 36"
Please Note: The manufacture of New frames, stretched with Mesh has a 3 day turnaround time. All of our Aluminium frames are manufactured in the UK and we have been supplying the Screen Printing sector for many years. We've literally sold thousands of frames and still re-mesh many of them over and over again. We pride ourselves in the quality of this product. It's not a cheap imitation, our Aluminium frames really are good. 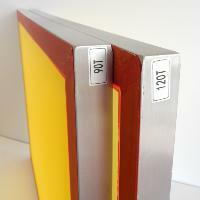 The standard sizes quoted are all constructed of a 40mm x 40mm x 1.6mm Aluminium Box section. We stretch these with the Screen mesh count of your choice to a finished tension of 20NCM. If you require any specific requirements, please inform us. For all New frames and re-stretching service, we work on a 3 - 5 day turn-around on all stretching. This ensures you get a high quality stretched product. NEW ALUMINIUM FRAME 23" x 31"